Gordon Comstock loathes dull, middle-class respectability and worship of money. He gives up a 'good job' in advertising to work part-time in a bookshop, giving him more time to write. But he slides instead into a self-induced poverty that destroys his creativity and his spirit. Through the character of Gordon Comstock, Orwell reveals his own disaffection with the society he once himself renounced. 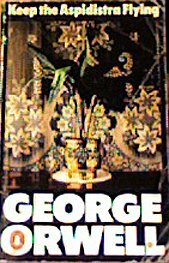 Insurance salesman George 'Fatty' Bowling lives with his humorless wife and their two irritating children in a dull house in London suburb of West Bletchley. The year is 1938. Doomsayers are declaring that England will be at war again by 1941. The book documents Orwell's investigations of the living conditions amongst the working class in the north of England before World War II. There is a long essay on his middle-class upbringing, and the development of his political conscience. Orwell depicts a world of real and mental violence, pure racism, corruption, bribing and blackmail. This hard-hitting book contains the main themes of Orwell's later work: immoral, secret, arrogant and violent behavior of a all powerful oligarchy.